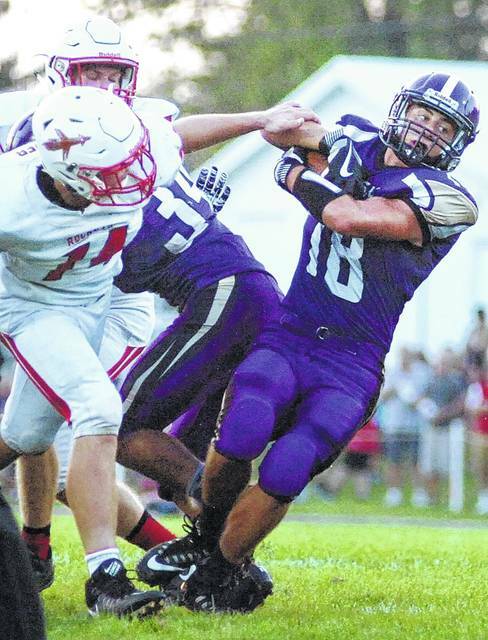 Leipsic’s Cole Williamson, shown here against Pandora-Gilboa running the ball, made his impact felt on defense and was the team’s top tackler. RETURNING STARTERS: Juan Pena (LB/RB), Jr.; Dylan Schroeder (QB), Sr.; Cole Rieman (WR/DB), Sr.; Gavin Lomeli (RB), Sr.; Ty Hiegel (WR), Sr.; Josh Ralda (DE), Sr.; Cole Williamson (RB/LB), Jr.; Clay Gerdeman (OG/DE), Sr.; Luke Schroeder (OT), Sr.; Ryley Spangler (OT), Jr.
PLAYERS TO WATCH: Wide receiver Cole Rieman has been first-team All-BVC the last two seasons. Quarterback Dylan Schroeder and running back Gavin Lomeli are coming back from injuries. TOP NEWCOMERS: Jorge Roman (DB), Sr.; Hunter Casteel (DB), Sr.
Aug. 24 North Baltimore 7 p.m.
Aug. 31 Columbus Grove 7 p.m.
Sept. 7 at Liberty-Benton 7 p.m.
LEIPSIC — Even at less than full strength last season Leipsic was a playoff team, the ninth year in a row the Vikings have reached the postseason. So, with a strong cast of returning player and two key players healthy again, Leipsic could be a playoff team again this year. Leipsic has starters back at 14 positions, counting two-way players, from last year’s team, which finished 7-4, including a first-round playoff loss to McComb. The Vikings’ plans were rearranged last season when leading rusher Gavin Lomeli, a 1,000-yard rusher in 2016, played only four games because of an injury and quarterback Dylan Schroeder played only six games because of a torn anterior cruciate ligament. Schroeder, who threw for 852 yards and six touchdowns, and Lomeli, who was limited to 175 yards rushing, are back this season, as is two-time first-team All-Blanchard Valley Conference selection Cole Rieman. Rieman caught 34 passes for 457 yards and four touchdowns last season and had five interceptions on defense. Two other returning offensive starters, both offensive linemen, also received All-BVC honors. Clay Gerdeman was second-team All-BVC and Ryley Spangler was on the third team. Linebacker Cole Williamson was the Vikings’ leading tackler last season. Williamson and Juan Pena, also a returning starter, lead a position group that could be a key to the defense. “We are a very experienced, physical football team. Our strength will be with that as well as our depth at linebacker and running back,” Leipsic coach Joe Kirkendall said. “We need to finish drives on offensive and defensively we need to be better against the pass,” he said. “We need to increase our big plays on offense and turnovers on defense. The Vikings will open at home on Friday night against North Baltimore. In a scheduling quirk, now that not all BVC play each other in football every year, Leipsic and Pandora-Gilboa will not face each other for the first time since 1965 this season. This entry was tagged High school football preview 2018, leipsic. Bookmark the permalink.